Dive Into the Universe with the new Starry Night Pro! 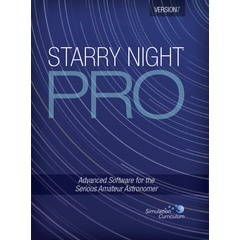 Stunningly realistic, Starry Night Pro immerses you in the wonders of the universe. A new layer of over 100 interactive, multimedia tours reveal the fascinating science and history of stars, providing a deeper understanding of the universe. An elegant, easy-to use interface with Universal Search lets you quickly tap into a new and improved suite of features. All the tools you need - events finder, computerized telescope control, observation planner, customizable equipment list, built-in ephemeris generator, printable 180-degree star charts - are at your fingertips. Powerful and fast, this program with access to 500 million stars and 1 million galaxies is a feast for your senses and fuel for your imagination. Expanded set of Space Missions, including 30 new detailed and accurate 3D models of spacecraft and their trajectories. Updates to new/ongoing missions.